Flexible installation choices for easy mounting. GP4000M Series can be easily mounted on a control panel through a φ22 mm circular hole. Its basic specifications include easy-to-see screens with TFT LCD expression in 65,536 colors and high connectivity brought by serial, Ethernet, and USB interfaces. The detailed catalog of GP4000 series is available. Experience Pro-face software such as screen creation, data collection, monitoring and so on before purchase. Already setup sample screens such as Robot Controller, Image Processing System, Inverter, and Temperature Controller are available. Make start-up, operation and maintenance work effective. 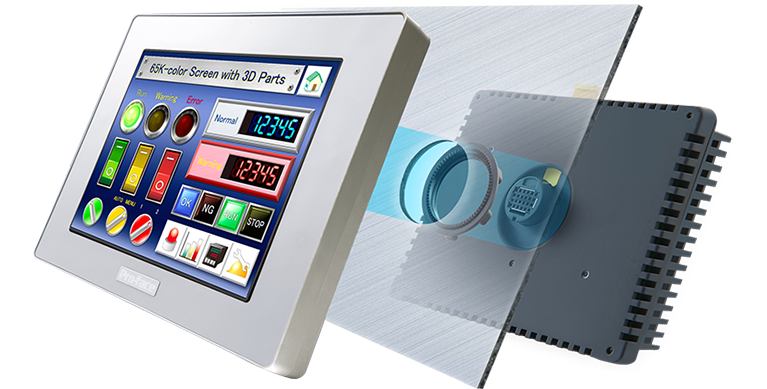 HMI Customized Service is available! Please check service details and contact our local Pro-face sales office for further information. See on-site screens displayed on a PC. See equipment information on a tablet or smart phone. See status at the production site anytime anywhere.